And there's progress in US-Russia nuclear talks. The United States and China are going a-courtin’. And the court’s in Moscow. Though none of the three countries are exactly natural allies, both Washington and Beijing are competing for Moscow’s favors. Let’s start with China. China’s new president, Xi Jinping, made his first official foreign trip abroad last week to Moscow, where he and Vladimir Putin had a lot of nice things to say about each other, and about their relationship. “The fact that I will visit Russia, our friendly neighbor, shortly after assuming presidency is a testimony to the great importance China places on its relations with Russia,” said Xi. After more than a decade of talks, Russia has agreed to supply China with natural gas, a deal that could see China surpass Germany as the largest importer of Russian gas. Officials Friday signed a raft of other energy agreements, including one to double Russian oil supplies and hand China’s state oil company a stake in Russian oil fields, tightening the nexus between Russia, the world’s largest energy producer, and China, the hungriest consumer. Lots of differences remain between Russia and China, of course, and there are plenty of obstacles in the way of anything like a Russia-China alliance emerging. Still, because the United States needs Russia as a partner on a wide range of issues—from arms control to Afghanistan to Iran’s nuclear program and the civil war in Syria—the Obama administration had better get on the stick in seeking a strong working relationship with Moscow. The good news: in the last couple of weeks it appears as if that’s exactly what they’re doing. Earlier in March, President Obama and Secretary of Defense Hagel abruptly canceled the next phase of a missile defense system in eastern Europe that had long been a thorn in the side of US-Russia relations. Leave aside that the system, ostensibly aimed at Iran (which doesn’t have any missiles) is vastly expensive, hasn’t been fully developed, and probably wouldn’t work anyway. By canceling it, Obama and Hagel have made it easier for President Putin to do a deal over nuclear arms, without overly agitating that Russian military. American officials went out of their way to say that it was a decision related to Iran, North Korea, and other missile threats, and that it had nothing to do with Russia, but no one’s buying that. Russian and American officials on Thursday reported progress in discussions about nuclear weapons reductions, in a sign that renewed cooperation may be under way just days after the United States canceled part of a Europe-based missile defense program that had infuriated the Kremlin. After meetings in Geneva on Tuesday and Wednesday, Rose Gottemoeller, the acting under secretary of state for arms control, and Sergei Ryabkov, a Russian deputy foreign minister, each issued positive comments, indicating that the two sides had renewed active talks on nonproliferation efforts, which had been largely stalled for months. “Busy, but productive few days in Geneva,” Ms. Gottemoeller posted on Twitter. Mr. Ryabkov was more expansive at a news conference Thursday upon his return to Moscow, where he announced that the dialogue had improved. “Rose Gottemoeller and I share the opinion that there is progress in the negotiations,” he said, according to Russian news agencies. “We have planned new contacts at various levels for the coming period,” he said. “Intensity of these contacts is not declining but in fact increasing, which shows that the work is moving ahead vigorously.” But he also cautioned that no new agreements had been reached or were even yet on the table. The intense engagement on the reset led to notable achievements, including the New Start nuclear arms treaty and Russia’s entry into the World Trade Organization. But after more than a year of deteriorating relations, the administration now envisions a period of disengagement, according to government officials and outside analysts here and in Washington. The main goal seems to be to send a message that the United States views much of its relationship with Russia as optional, and while pressing matters will continue to be handled on a transactional basis, Washington plans to continue criticizing Russia on human rights and other concerns. As for the anti-Americanism, the new approach might be described as shrug and snub. Well, that all seems in the past. 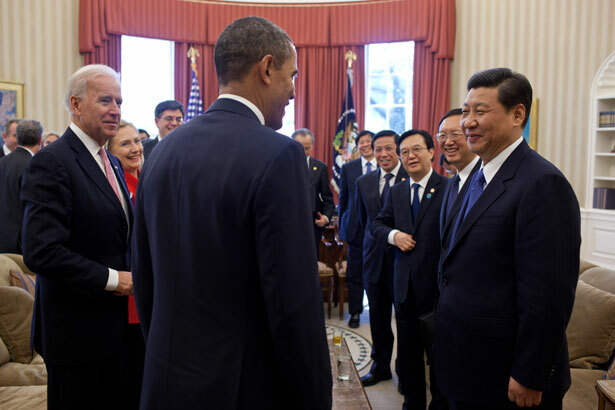 It’s not that the visit to Moscow by Xi Jinping convinced Obama that resetting the reset wasn’t a good idea—far from it. But it helps when there is healthy competition for the favors and attention of Moscow. The various irritants in US-Russia relations aren’t going away, but the neoconservatives and other hawkish, reflexively anti-Russia hawks in the United States don’t seem to have the upper hand. Former general James Cartwright has come out against drone strikes, Robert Dreyfuss writes—will President Obama listen to his old friend?